New 14 k Solid Yellow Gold Stud Earrings With the 6 mm Round Simulated Pearl Large Screw Back for kids or ladies. Fastening Large screw back. Stone color: White Pearl. Shape : Round Ball. 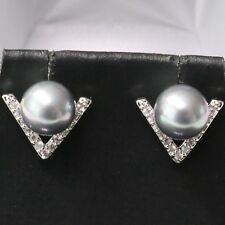 This is a really luxury, well-designed, elegant gray Akoya pearl earrings. 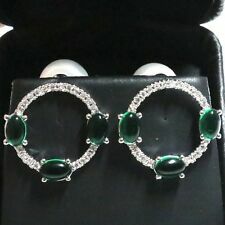 The earrings are made from 18K gold plated alloy. It's a 7 mm size top quality Akoya pearl in perfect round shape, the surface of pearl is flawless and the luster is highest in saltwater pearls, the stud body used 18K plated alloy. Pure 925 Sterling Silver Jewelry. No alloy, nothing. If you like to make any changes to be made on a particular product of ours for ex. We use AAAA quality stones which gives even better radiance than real diamonds & gemstones. Main Stone: Round White Akoya Pearl. When you open the box you will be amazed! It's a 9 mm size top quality white pearl in round shape, the surface of pearl is flawless and the luster is very strong, the body is 14K white gold plated. 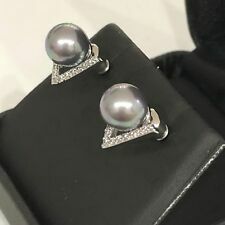 The gorgeous level back design makes these pearl earrings very classic, elegant and good looking, and great to wear with formal wear, work attire, and casual wear! It's a 13 mm size top quality grey pearl in round shape, the surface of pearl is flawless and the luster is very strong, the body is 14K white gold plated. These glowing white pearl earrings are made of AAA Akoya pearl that has an amazing shine and sparkle! When you open the box you will be amazed! 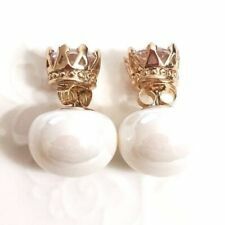 It's a 10 mm size top quality white pearl in button shape, the surface of the pearl is flawless and the luster is very strong, the body is 14K rose gold plated. Pure 925 Sterling Silver Jewelry. No alloy, nothing. If you have a particular design in mind, we can manufacture customised products as well. If you like to make any changes to be made on a particular product of ours for ex. A stunning Round cut red Pearl make this Earring Stud a gorgeous and chic accessory. The fancy colors looks good on a little black dress for an elegant look, or match it with a white blouse for a date look. 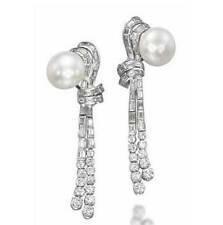 These glowing white pearl earrings are made of AAA Akoya pearl that have an amazing shine and sparkle! When you open the box you will be amazed! 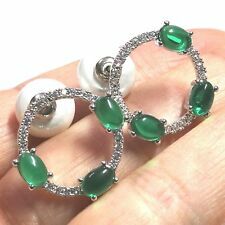 It's a 8 mm size top quality white pearl in round shape, the surface of pearl is flawless and the luster is very strong, the body is 14K white gold plated. 13mm Red Crystal Pearl Stud Earrings Handmade Hollow Bridal Wedding Jewelry. These red pearl stud earrings are classic, beautiful and elegant. It's a 13 mm size top quality red pearl in round shape, the surface of pearl is flawless and the luster is very strong, the body is 14K white gold plated.